I was fortunate enough to attend the 3rd annual Americas Team Championship in Milwaukee this last weekend, along with a team composed of my LoS co-hosts Chandler and Bret, and two gentlemen who I had never met before the event but quickly became fast friends with. I took a pretty unconventional Circle pairing, since Bret had dibbsed Iona and I wanted him to have a strong pair in Wurmwood. What kind of unconventional? I have to confess that we, as a team, were pretty unprepared for this event. 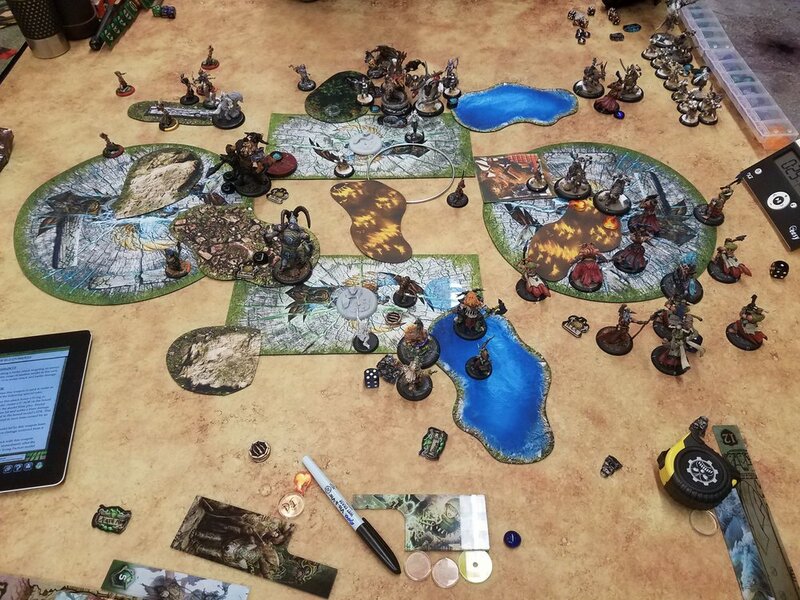 I hadn’t played a game of Warmachine on a table since WMW three months prior, and I believe our other Skorne player hadn’t played recently either. Chandler had switched factions less than three weeks earlier, and Bret was jonesing to find more bad matchups for Iona. Round 1 we found ourselves paired against Dull Chedder, natives of the area, and as per our strategy we always chose to choose our tables rather than 3 of the matchups. This meant that I got a sweet table with a fire cloud in the center against a lovely gentleman named Randy and his pair of Thagrosh 1 and Lylyth 3. I won the roll off and opted to go first, since none of his things except Azreal ignore stealth at significant range, so Lord of the Feast can get up the table pretty far and threaten the board. Brighid and Caul put prey on Typhon to hopefully keep him out of the fight. My Bloodweavers opted to ambush this game. I unpack my doubled up units of Ravagers by moving up one from each unit into walk and shoot range from the Raptors and keeping the rest in reserve. Grayle gets Harmonious Exaltation from the Blood Shaman and puts Storm Rager on Lord of the Feast and Death March on Brighid and Caul. Lord of the Feast moves up to threaten a big piece of the board and stay away from the Hex Hunters and Azreal. The Wolf Rider Champs move up and, stymied on the right by other models who threat as far, stay cautious. Randy responds by moving up and shooting down two Ravagers from the same unit and repositioning back. Thagrosh moves up behind a beast bunker and casts Fog of War on himself and Draconic Blessing on Azreal. His Hex Hunters space out, trusting their DEF 14 to keep some alive from the inevitable incoming Ravagers and Night Witch. I can get to lots of targets this turn, and I don’t want to get shot next turn, so it’s feat time. Bloodweavers ambush top left. First, though, the Lord of the Feast gets buffed to high heaven. I sac a Ravager to put Divine Inspiration on him, and the Spirit Cauldron puts Puppet Master on him as well. This is key, because when he moves up and tries to Raven Azreal, he misses the first shot due to Fog of War and I have to reroll. Between his initial Blood Reaper and transfers, Lord of the Feast successfully cripples Typhon’s mind, Zureals Body and Mind, and leaves Thagrosh on 5 with no transfers. Grayle moves up, feats, and puts Wind Blast down, since my original plan is to send Caul into Typhon now. Sadly, the Bloodweaver Night Witch only kills 2-3 Hex Hunters before running out of steam, so there are still a bunch of them in the way. Ravagers fix this problem for me a minute later, but I have already moved Caul back to be a Shield Guard for Grayle, since I think assassination is one of the few ways I am losing this game now. Ghetorix puts Spiny Growth on himself and tramples into the opposite zone, figuring that with Azreal being the only beast in commission, he should be fine. The Bloodweavers and the Wolf Rider Champion both fail to land hits on Craelix, which is sad, but I have locked down most of the table now and I pass the turn back to Randy. With a mostly crippled set of heavies, Randy is in a tough spot here. Craelix flails at Bloodweavers and fails to kill any. Thagrosh flattens Lord of the Feast and camps quite a few, toeing the killbox. His Raptors charge into my Ravagers and kill a few, repositioning around into my zone. Typhon eats a couple Ravagers as well, and then Zuriel and Azreal scratch Ghetorix’s paint up a bit, but with Rapid Healing and Spiny Growth up Ghetorix is fairly tanky. At the end of the turn, I score a point for my zone and Ghetorix has remained unmoved in Randy’s so the score becomes 1 - 0. At this point, all I need to do to get four points is clear three models in the right zone, kill Craelix and run my Bloodweavers into the left zone, and kill the objective with something. The Wolf Rider Champion jumps behind Craelix and kills him dead, so the Weavers run back into the left zone. On the right, it takes a few Ravager charges, but the contesting models are all cleared. Ghetorix munches down on Zuriel, warping snacking to remove him from play. Finally, with no other options around, the Blood Shaman sacrifices Caul to give Grayle Divine Inspiration. Grayle charges the objective and kills it in two attacks for the fourth and final point. I would first like to thank Randy for a very pleasant game - he was a fantastic opponent from beginning to end. I also really like his list - it’s one of the things I would be interested in trying in Legion. I felt like I won the list chicken pretty hard, as Krueger would have had a much harder time into this matchup I feel and Lylyth 3 would have butchered Grayle. Lord of the Feast with Storm Rager is just as terrifying as expected (not surprising), and Wolf Rider Champs continue to impress. My team ended up winning this round 4 - 1, and I’ll see you back here for the report of round 2!